This week's salute is actually a few days late following Monday's All Staff Day at ImaginOn. If you missed the event (and there were few staff that did) there were several PLCMC photographers catching the action. 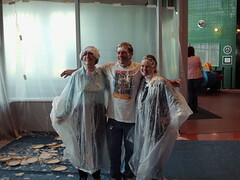 Among the day's highlights was the Throw-a-pie-at-your-favorite-admistrator fundraiser for United Way with Chuck Mallas, Carol Myers & Susan Harden stepping up to the plastic mat. All in all it was great day and I think the three raised over $600 -- all for a good cause.